Oh yeah this was good. Really good. I don’t know why, but I haven’t made this recipe in a while. It was passed to me by my friend Namrata. She used to whip it up all the time when we were in school. Late at night, after a long day of studying in the library; instead of ordering in, she would fire up the stove and cook this for the whole crew. With just some rice and greens on the side. Tasty, comforting, flavorful, full of nuances but not too strong. Everybody loved it. This is a simplified version of Namrata’s mum original one for Murgh Makhani; which requires - among other things - the chicken to marinade overnight. 30-minute it's all you need to make this happen in your kitchen. TBH, I’ve never tried Namrata’s mum version (which I bet it’s amazing) but this is a knock your socks off kind of recipe. So quick and simple. It actually takes longer to gather all the ingredients than cooking the dish. If you’re not familiar with butter chicken, don’t be deceived by its name. It doesn’t taste at all like butter. Not that there’s anything wrong with butter, it just doesn’t taste like it. 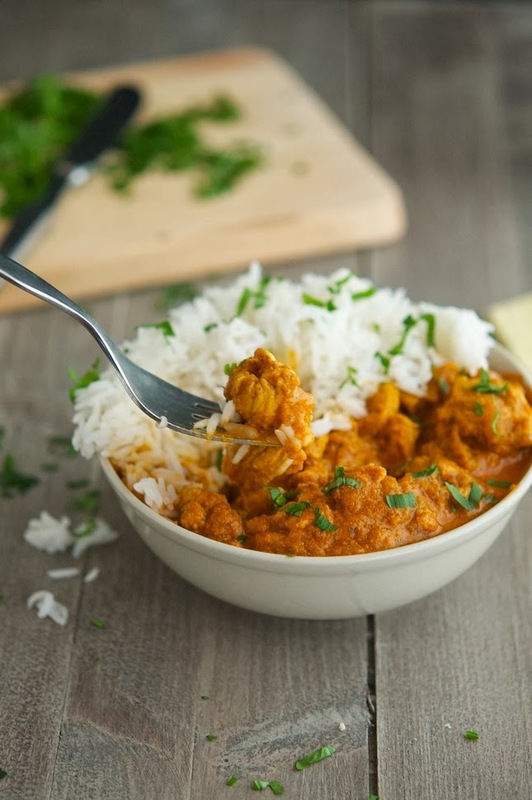 In fact, this creamy curry Indian butter chicken recipe combines ethnic spices with simple ingredients like onion, ginger, garlic, and tomatoes for a wonderful dish. 30-Minute Butter Chicken (Murgh Makhani) Print this recipe! In a large frying pan over medium-high heat melt the butter, add onion and saute’ until golden brown, about 5 to 6 minutes. Add ginger, garlic, coriander, chili powder, turmeric and 1 teaspoon of salt and saute’ for a minute, until spices are fragrant. Add tomatoes and tomato paste and cook for 3 to 4 minutes, stirring every now and then. Turn off the heat and with an immersion blender (or using a stand blender) purée until smooth. Turn the heat back on to low, add fenugreek (if using), milk and chicken. Cook covered for about 14 to 16 minutes until the chicken is soft and cooked through, stirring every so often. When the chicken is cooked through, remove the lid and cook for further 2 minutes. Add Garam Masala, Greek yogurt and mix well, making sure it doesn’t boil. Adjust seasoning to taste and serve sprinkled with fresh chopped cilantro. One serving yields 263 calories, 11 grams of fat, 12.6 grams of carbs and 30.6 grams of protein. I need this in my life, now! I adore Indian cuisine! When I attempt to make any Indian dish, I always end up falling back on sauces as I tend to make a mess of the spice quantities, resulting in something too spicy or too bitter. 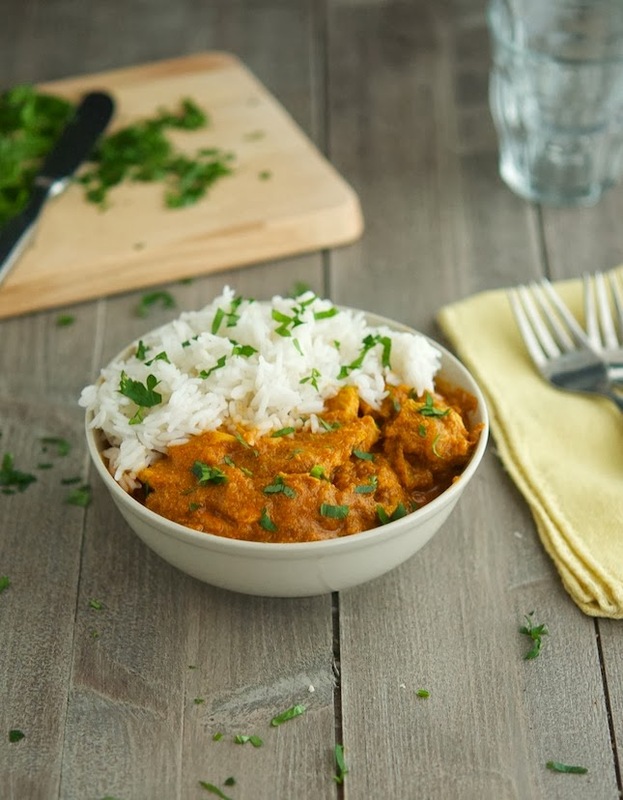 This butter chicken, however sounds like it is simply FAB, Aaaand - it looks so incredibly good! This is a foolproof recipe Sash, I'm sure you're going to fall in love with it! Kudos Atika, lemme know how you like it! Would you believe me if I told you I never had butter chicken in my life? I think I need to fix this. But tell me... why is it called butter chicken if it doesn't taste like butter? I feel cheated and I demand an answer! I know, it's kind of weird that it's called butter but there's actually little butter in it and it doesn't taste like it. I think I drooled a little bit while I read this ;-) I've actually been looking for a good butter chicken recipe to try out. Looking forward to giving this one a try! That's awesome Lex, lemme know how you like it! your description of this dish alone has sold me on it! i have to make it now! i'm thinking of doing something weird though. OMG, you should totally go for it Joanna but you have to promise to let me know the outcomes. Pleaseeee...I'm so curious! I assume that you should add ground coriander along with the garlic, chili powder, ginger, and turmeric? The instructions don't mention it. Where do you get Garam Masala? I've looked in a few different places and no one carries it! 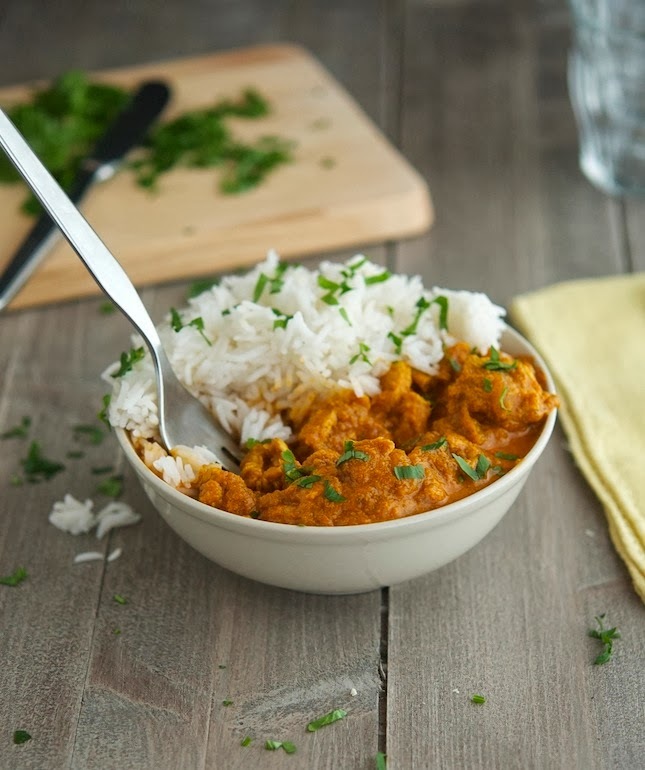 Butter chicken is my absolute favorite Indian dish and I would love to be able to make it for my family! Penzey's has it as well as many other fresh wonderful spices. I usually get Garam Masala at Whole Foods. They sell a couple of brands such "Simply Organic" and "Frontier". I've seen it at Trader Joe's and Fairway too, not to mention spice stores where you can buy it in bulk (which is very convenient). As a last resort you can order it through an online store, such as Amazon or TheSpiceHouse. When you say coriander, do you mean the leaves or the seeds? i make curries all the time, but it usually takes some time and is a mess to clean up for only 2 people, This is rocking good stuff!! I appreciate you posting this recipe! i made it last night and wow, my wife loved it too! Thanks!! 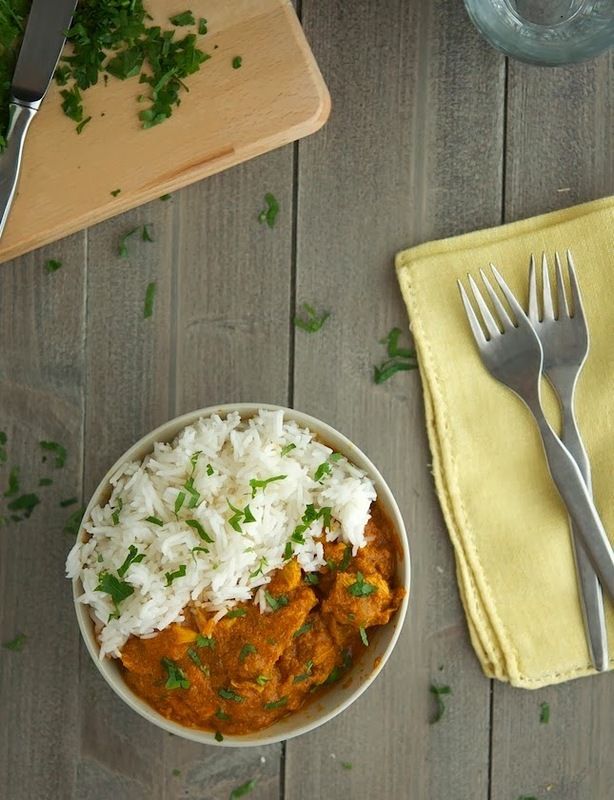 If you liked it that much, you should totally try my Chicken Tikka Masala, just as good. Did it and it tastes at least as good as it looks! Mike, thank you very much for the tip! And I pray you have some more Indian or Thai friends willing to share their recipes with us. Thanks Raluca, and trust me when I say than I'm trying to bribe a Thai friend to give me her secret recipe for the spicy red curry she makes all the time. So good! We made this last night, it's fantastic! So easy, tasty and delicious. Thank you so much for sharing! This was so delicious and easy. My whole family loved it, too bad there are no leftovers left. Double batch next time! Delicious, I made this with 1/2 chicken, 1/2 Tofu and added steamed peas and broccoli when served. Was amazed when the kids came back for seconds! You did a great job David tweaking the recipe to your liking, and your kids are real foodies, aren't they? I've been working through a number of your recipes now and this one was easy and delicious ! Lovely clicks and amazing recipe! YUMMY! Wow I just landed on your blog from StumbleUpon - what a find!!! This looks incredible. You have nailed it my friend. 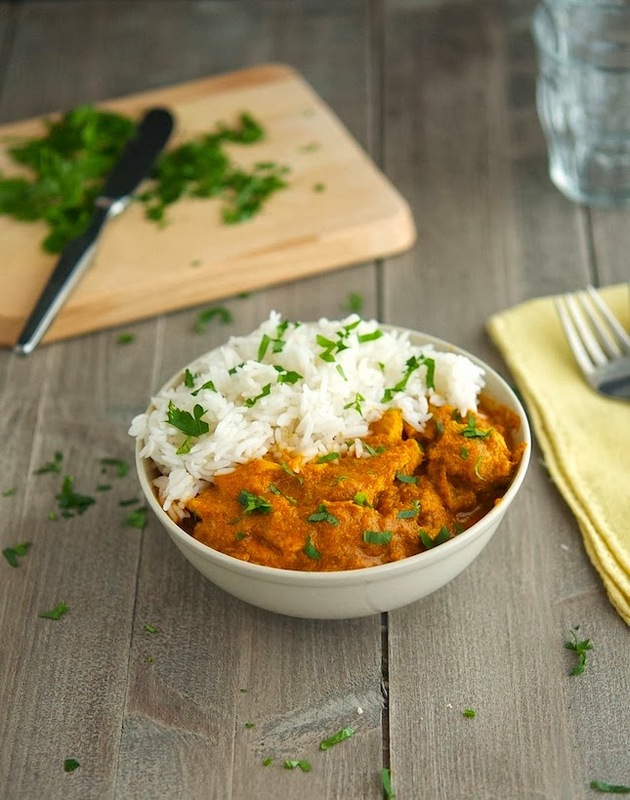 We all love butter chicken on any good day!